Martine brings a wealth of experience working at the intersection of education and economic security to the State Policy Fellowship. Previously serving as a teacher for several years in North Carolina, Martine saw firsthand the implications of social and economic policies that disproportionately affect low-income communities and the complexities and barriers to access her students faced. Yet, as an educator, Martine also saw how state-level policy is uniquely positioned to positively impact members of these communities. Martine’s experience led her to pursue a master’s in public policy from the Sanford School of Public Policy at Duke University, where she focused on education, criminal justice, and equitable economic development. Martine looks forward to bringing these insights to her work at the Budget & Tax Center. 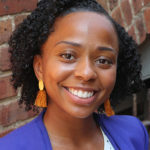 As a State Policy Fellow, she looks forward to marrying her critical thinking and robust analysis skills with advocacy and cross-sector collaboration in order to drive social and economic policy change in North Carolina.